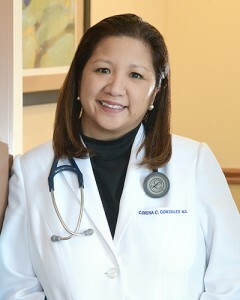 Dr. Corina Luz Gonzales is an experienced primary care doctor, board certified in Internal Medicine. Before joining us, she practiced at the Internal Medicine Group in Norwich, Connecticut from 2009 to 2013. When Dr. Gonzales was a medical resident, she received the annual award given to a doctor in training who embodied the ideals of: compassion, kindness, integrity, and commitment to sensitivity towards patients. She continues to follow these ideals today. To assure the highest standards, Oldendorf Medical Services consistently monitors clinical performance improvement and patient satisfaction quality improvement measures. We are happy to answer any questions you may have about our services. is is one of the few primary care offices in the country to be included in the national Comprehensive Primary Care Initiative. At OMS, we believe that creating a caring and respectful relationship with our patients is a vital part of our role in our patients’ health care. By offering comprehensive medical services and personal attention, we hope to serve as your primary health care provider for many years to come. A major part of our commitment to improving quality is our pledge to publicly share our performance data and provide clear explanations of what these measures mean.